BAGUIO CITY – The organizer of the 38-day Baguio Blooms Exposition and Exhibition is appealing to the members of the local legislative body to extend the duration of the event to allow the exhibitors to recover from the losses that they will incur on their impending transfer from the skating rink to the Ganza parking area. Maribel Chagwaten, organizer of the Baguio Blooms Exposition and Exhibition, claimed that the transfer of the 190 stalls from the skating rink to the Ganza parking area will take at least 3 to 5 days because of the enormous work involved which is more than the 2-day period to transfer based on the decision of the local legislators. “We will abide with whatever the decision of our leaders but we should not be made to suffer from whatever their personal or political differences. 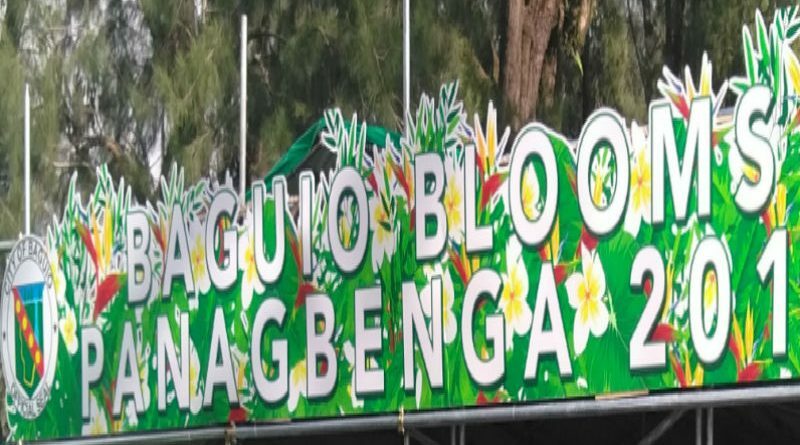 We are business people wanting to help in the success of our flower festival that is why we participated in the bidding for the organization of the Baguio Blooms” Chagwaten stressed. The Baguio Blooms Exposition and Exhibition, previously known as the market encounter, is one of the income-generating activities of the Panagbenga otherwise known as the Baguio flower festival where part of its proceeds are used to subsidize the participating landscapers, cash prizes for the winners of the flower festival events, among other Panagbenga activities. From the supposed 280 stalls measuring 4 meters by 3 meters in the skating rink area, the organizer admitted that because of the re-designing and re-positioning done to spare the trees from being affected by the activity, the number of stalls was significantly reduced to only 160 stalls measuring 4 meters by 3 meters and 30 stalls with lesser measurements. Chagwaten added that of the total number of stalls, 145 have been devoted for dry goods and 45 stalls are for food items. According to her, there will only be 145 stalls that could be accommodated by the Ganza parking area that is why utmost understanding and consideration should prevail on the part of concerned local officials so that the exhibitors will be able to recover from their expected losses due to their relocation to another place which means additional cost on their part to transfer the stalls. On the issue that there was trimming and pruning of the trees by the organizer, Chagwaten explained that while they were laying out the stalls at the skating rink, personnel of the City Environment and Parks Management office (CEPMO) were doing regular pruning of the branches of trees in the area wherein she requested that the branches of the trees inside the skating rink area should also be pruned as part of the maintenance of the trees, thus, it is irresponsible and unfair for some respected city officials to be posting on social media photos of the pruned trees and issuing unnecessary remarks without verifying the facts on the matter. Chagwaten has been a trade fair organizer involved in various exhibitions inside and outside Baguio and La Trinidad over the past 8 years. She disclosed that most of the city officials who had criticized her since she started organizing the Baguio Blooms last year are her friends but she does not know if they consider her as their true friend.